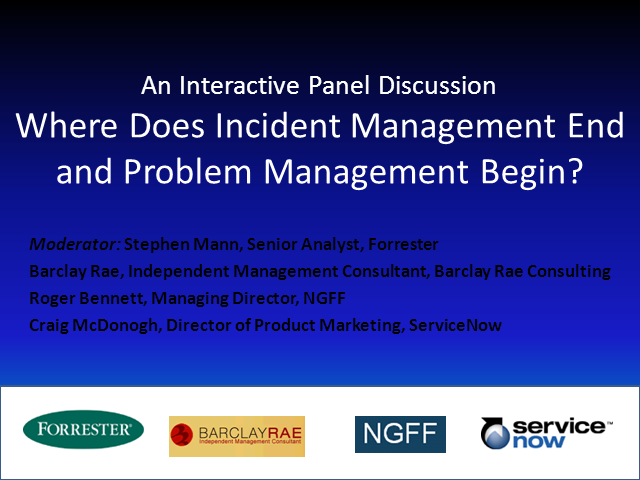 Where Does Incident Management End and Problem Management Begin? Within far too many organizations, Problem Management can be considered somewhat of a “poor-relation” to its “sister” Service Desk and Incident Management activities. While the Service Desk and Incident Management processes often receive adequate investment in terms of staff, definition, training, and ongoing operation, Problem Management is often “something to be done later (when we have more time)”. A common issue is that organizations think that they “do” Problem Management when in fact all they do is react to major incidents – they don’t do Proactive Problem Management, that is investing in IT operations to prevent future issues, the proverbial “spending a penny to save a pound”. One possible cause of this all-too-common scenario is that problems are often confused with incidents (with the terminology often interchanged), or are seen as an incident state rather than a separate entity requiring a different type of response. However, of the major ITIL processes, truly-effective Problem Management activity can provide some of the highest returns to an organization. This panel session will offer real-world guidance on how best to leverage ITIL-espoused Problem Management policies, processes, tools, and techniques to deliver real value to the business. A select group comprised of an ITSM practitioner, an ITSM consultant, and an ITSM tool vendor will work together facilitated by an ITSM-focused industry analyst to tease out the issues (including the confusion as to what problems actually are), best practice solutions, and quick wins to help you succeed in your Problem Management adoption and overall ITSM maturity evolution. Title: Where Does Incident Management End and Problem Management Begin?